A 56-year-old female with a 38-pack-year history of tobacco use presented with nonproductive cough, severe back pain, anorexia and weight loss. 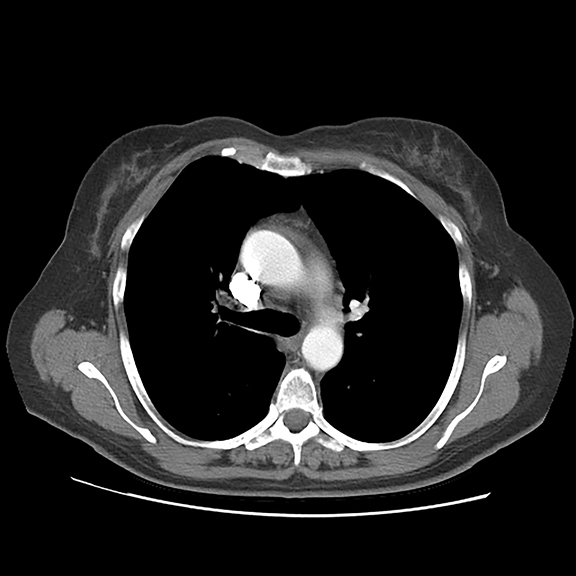 A CT scan of the chest revealed a confluent right hilar and mediastinal mass (Figure 1). Bronchoscopic biopsy confirmed small cell carcinoma of the lung. 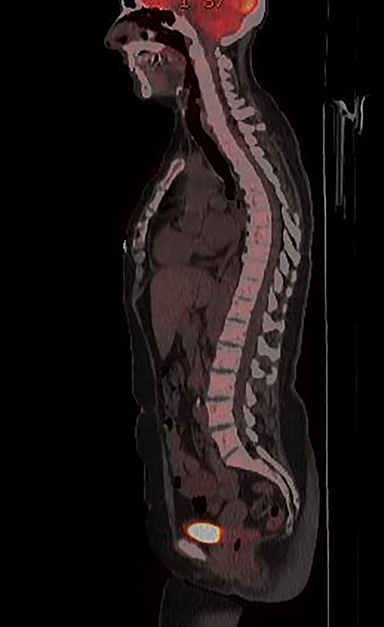 MRI of the lumbar spine demonstrated several bone metastases (Figure 3). She began chemotherapy with etoposide and carboplatin with pegfilgrastim (Neulasta) prophylaxis. Additionally, denosumab (Xgeva) was initiated for osseous metastases. After initiation of chemotherapy, the patient had significantly decreased pain and reduced cough with complete resolution of her primary pulmonary mass, but she developed sclerotic lesions after denosumab therapy. 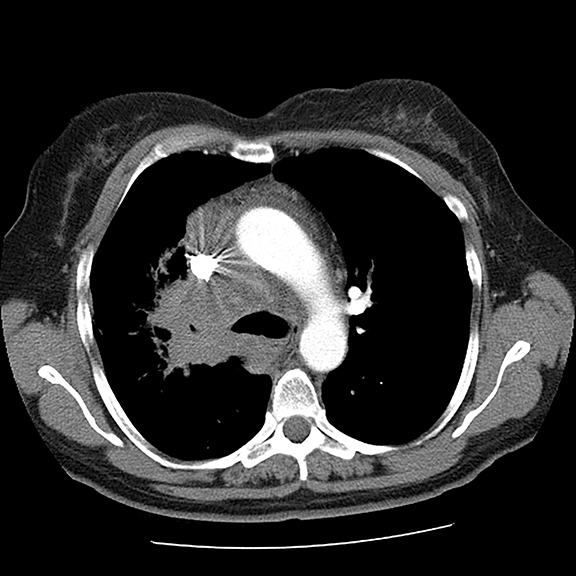 Initial axial CT of the chest demonstrated confluent a right hilar and mediastinal mass (Figure 1). 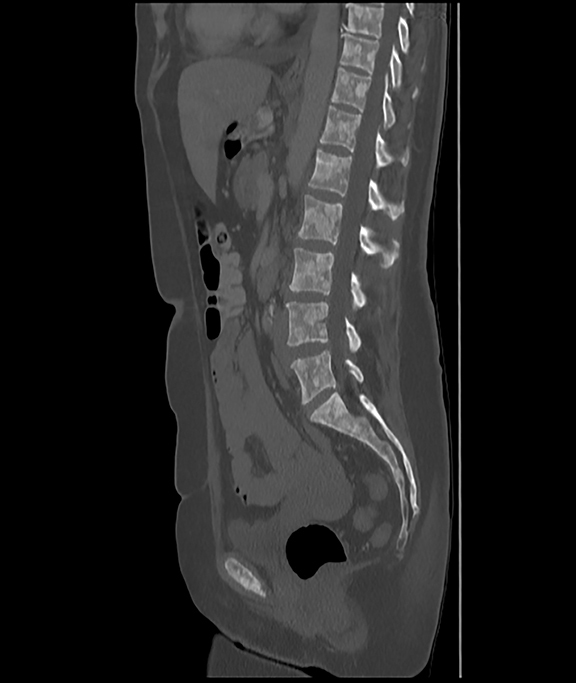 Sagittal reconstructions of CT abdomen and pelvis did not demonstrate any overt metastases (Figure 2). 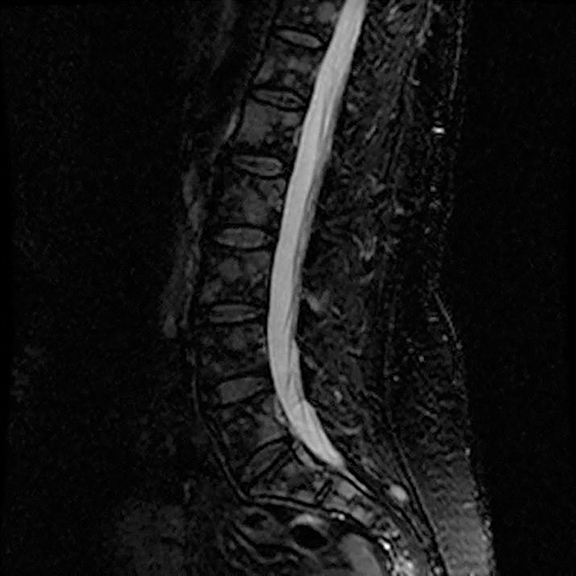 MRI assessment of the lumbar spine (STIR sequence) demonstrated T2-hyperintense metastases (Figure 3). Post-therapy axial CT images demonstrated resolution of the thoracic mass lesions (Figure 4). Post-therapy CT images of the lumbar spine demonstrate osseous sclerotic response with several new sclerotic lesions (Figure 5). These lesions were not FDG-avid (Figure 6). This is a novel case report describing the unusual but possibly expected osseous sclerotic response to treatment with denosumab. Denosumab is a novel, fully human monoclonal antibody approved by the FDA for treatment of bone metastases. It works by inhibiting the maturation of osteoclasts, specifically by binding to and inhibiting the receptor activator of nuclear factor kappa B (RANK) ligand. At the time of this report, our patient had received 2 doses of subcutaneous denosumab along with four cycles of chemotherapy. During the course of her therapy, there was complete resolution of her primary pulmonary mass. The skeletal lesions, which were barely noted on pre-therapy CT and nuclear medicine imaging studies, responded with severe sclerosis. The patient had significantly reduced pain and required lower doses of narcotic analgesics. There have been some case reports of denosumab-related osseous sclerosis in pediatric patients being treated for giant cell tumor (GCT) of the bone. 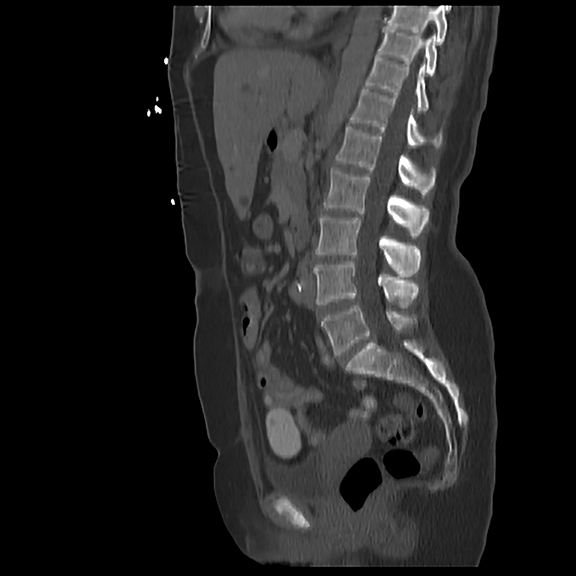 The sclerotic response was noted in the primary GCT and at metaphyses of unrelated bones.1,2 We postulate that the unusual severe sclerotic response seen in this patient is at least in part related to denosumab therapy. To our knowledge, this is the first case reporting the osseous sclerotic response in a patient with pure osteolytic metastases receiving denosumab therapy. Further case series or retrospective studies may delineate an association between denosumab therapy and such a sclerotic response in the lytic lesions. This response may not be as dramatic in patients with purely or predominantly osteoblatic lesions. Denosumab is a novel osteoclast inhibitor increasingly being used in patients with metastatic cancers to prevent SREs. It can potentially cause a severe sclerotic response at sites of osteolytic metastases. Radiologists must recognize this in order to avoid misinterpretation of the sclerotic response as disease progression. Kobayashi E, Setsu N. Osteosclerosis induced by denosumab. Lancet. 2015; 385(9967):539. Hakozaki M, Tajino T, Yamada H, et al. Radiological and pathological characteristics of giant cell tumor of bone treated with denosumab. Diagn Pathol. 2014;9:111. Kurata T, Nakagawa K. Efficacy and safety of denosumab for the treatment of bone metastases in patients with advanced cancer. Jpn J Clin Oncol. 2012;42(8):663-669. Padhani AR, Gogbashian A. Bony metastases: Assessing response to therapy with whole-body diffusion MRI. Cancer Imaging. 2011;11:S129-145. Radiological Case: Denosumab-related osseous sclerotic response in metastatic small cell carcinoma of the lung. Appl Radiol. Prepared by Dr. Rangaswamy while an Assistant Professor of Radiology, Dr. Osborn while serving as a Medical Oncologist, Dr. Prasad, while a Clinical Fellow in Endocrinology; and Dr. Akindele while an Assistant Professor of Radiology, at the University of Pittsburgh Medical Center, Passavant, PA.